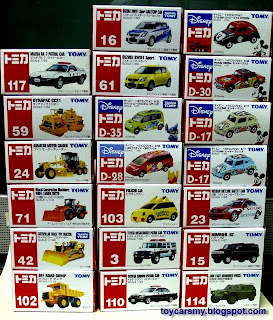 Chris Ting has influenced by me on the Tomica collection. He restarted his collection on this little cars lately, which he had collected a few at least 10 years ago. It is not difficult to tell Chris collects tractors, from the picture, the #42 caterpillar has yet available in Malaysia. I was surprised to see him collects Disney series cars too, it just can’t fit his image with the cute-cute cars especially the Pikachu.